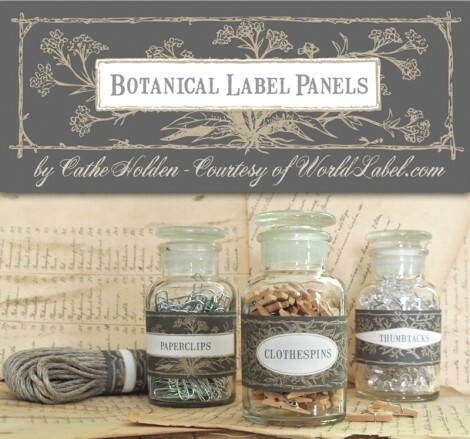 Whether you’ve begun scheming handmade & homemade gifts for the Fall and Winter holidays, or just need a good reason to begin organizing your stash, I’ve designed some vintage botanical label panels courtesy of WorldLabel.com just for you. 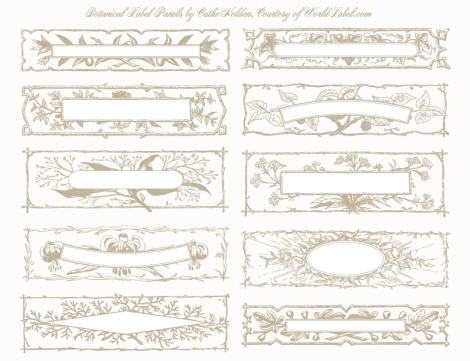 Head over to the WorldLabel.com blog for more details, free digital downloads in five different colors, and a crafty list of ideas for use. All of the free PDF label files are made fillable, so you can type in any wording, or print and write by hand. Enjoy! This entry was posted in Free Clip Art, Free digital collage sheets, Free digital downloads, Free PDF files, free vintage art, Labels, WorldLabel.com and tagged Free digital downloads, labels, WorldLabel.com. Bookmark the permalink. These are wonderful, Cathe! Thanks so much! Love the botanical labels! Thanks for sharing them. 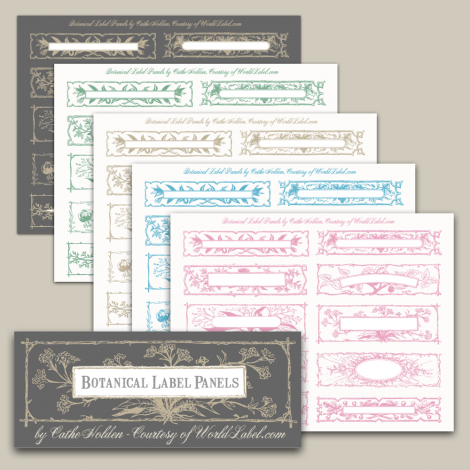 Thanks so much for these labels — they are lovely! I will use them with my information on the backs of my hand made paper creations primarily, but they will look awesome as labels in my craft space as well. hi, wow, we are nieghbors, i was trying to find labels and found your stuff. so fun, anyhow, can we talk and see if you can help me profs..on some labels, for our new vacation rental in petaluma? you can reach me at this email…. wont to have labels and logo for the bath products and soaps and stuff? love your pin cushions and the ribbions and a lot of things you made actually . well, as i look even deeper into all your work. I LOVE IT ALL. HOW FUNMAKES ME SMILE!!! Thank you!!! You are beautiful person!! !